"Once in a life time unforgettable Experience!" Since last couple of years, we were thinking of going to Tanzania with our two grown up Children. Tanzania is a birthplace of mine and my wife. We wanted not only to do safari in Tanzania with our kids but also wanted to visit our Birthplaces. (Near Singida and my wife’s birthplace in Dar-es-salaam). While searching on Internet, I came across “Chalo Africa”. After talking to Sangeetaji and explaining the places we wanted to visit, Sangeetaji in the Chalo Africa USA office prepared a Draft copy of Itinerary. We changed the itinerary a few times and she customized our 12 days Itinerary with suitable Camps/Lodges included visit to Singida and Dar-es -salaam. She suggested different options and answered all our queries. How can I forget Malvikaji? Malvikaji and Sangeetaji from Chalo Africa provided good details in Itinerary of what we will see/visit / activities for each day. Their Digital Itinerary was Superb and Excellent. We just came back from Tanzania Safari (August/September, 2018) three weeks ago. Everything went as planned and we had an amazing time. We are extremely happy with all the arrangement Chalo Africa provided as per our itinerary, making sure that lodges/camps could meet our special food requirements (Indian /American Foods). Chalo Africa had used “Kibo Guides” from Arusha as a ground Handlers. Our vehicle Land Cruisers was brand new with low mileage. Our Driver/Guide, Samson Peter Mweta, from Kibo Guides was excellent and knowledgeable of all animals. He was well informed and answered all our questions in details. His communications and service were outstanding. He took care of us very well. He stayed with us during the Safari and our visit to Singida until he dropped us off at the Kilimanjaro Airport. During our stayed in Parks, all our Camps/ Lodges like Kilivillas, Maramboi Tented Camp, gorongoro Sopa Lodge, Kubu Kubu Tented Camp and Mara River North Camp were very nice with all amenities provided. Food/Drinks at the Camps were very good and Camp Staff was very hospitable. We visited Tarangire NP, Lake Manyara NP, Ngorongoro Crater and Serengeti NP. We saw all Big fives and all different animals, Birds etc. At the end of Safari at Mara River, We saw Wildebeest River crossing Migration for nearly three hours. Once in a life time unforgettable Experience! During our Safari trips, Chalo Africa also stayed in touch with us through WhatsApp Group to ensure everything was going good. Our both Children were also happy that we planned our trip with Chalo Africa with Kibo Guides as ground handlers. 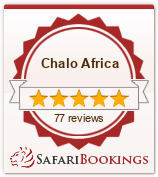 We highly recommend planning your next safari with Chalo Africa. It was a trip of a lifetime. Thank you “Chalo Africa “and their Team! Travelled to Tanzania in August 2018 on a Safari.